The OXO Tot Nest Booster Seat is a Booster Seat with Straps that will bring kids to the family table from as young as nine months. The Nest Booster Seat was designed with a soft cushion, as well as a high back and sides, to make any grown-up chair comfortable for your little one. It was also designed to be easy to clean and store, to make the after-meal clean up comfortable for you. The 3-point harness keeps even the wiggliest tot secure, and is adjustable for growing kids. 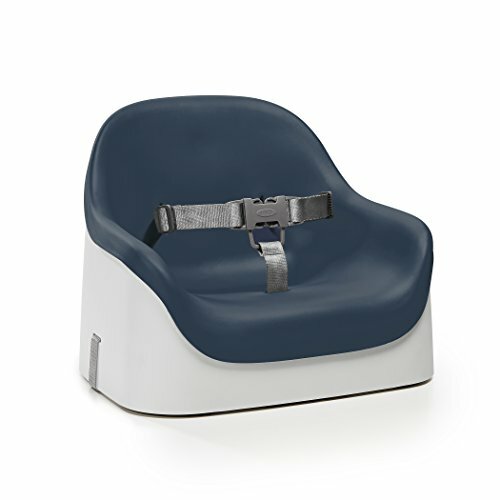 Two side-release buckles keep kids securely strapped in (and keep them from escaping.). The back and bottom chair straps are adjustable for a secure fit on different chair styles and sizes and the non-slip feet keep the Nest Booster Seat stable while protecting chairs from scratches. The built-in handle allows for easy transport and the straps are removable for children over 3 years. Whether for a quick trip to Grandma's or for long-term storage, the straps store neatly in a compartment under the Booster Seat. The simple, sleek design complements any home decor.